TURKEY: Ottoman, Abdul Mejid, Large AE 40 Para, Qustantiniya, AH 1255 AU-UNC! 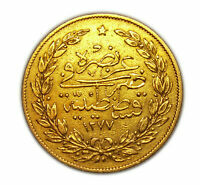 Details about Turkey 100 KURUSH 1923 / 47 22 k 917/1000 Gold Coin . Turkey 100 KURUSH 1923 / 47 22 k 917/1000 Gold Coin .